The car jumped the curb and barreled down the sidewalk, smashing into a group of people in Bushwick. Gus Rosendale reports. A day of fun ended in a moment of terror for a group of people partying on a sidewalk in Brooklyn Labor Day. 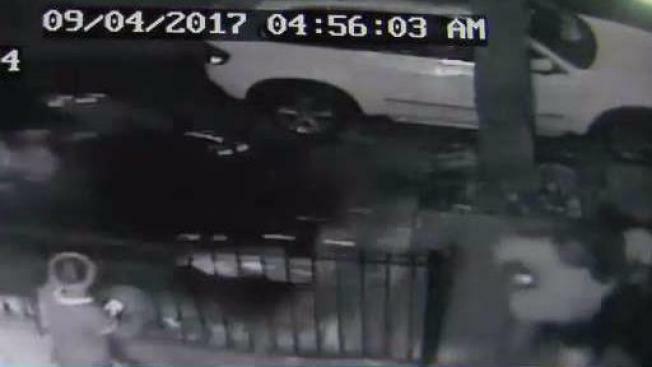 Surveillance footage captured the moment a car jumped a curb in Bushwick early Monday morning, racing down the sidewalk and slamming into a group of people. At least six people were injured after the black Infiniti roared onto the sidewalk near the corner of Halsey Street and Wilson Avenue and hurtled into the group, who were enjoying an early-morning J'ouvert party shortly before 5 a.m.
At least four people were taken to hospital with injuries, one was initially reported to be in a critical condition. Latoya Robinson had her ankle fractured in the crash, while another man suffered a broken leg. Robinson believes her life was spared by a matter of inches. Surveillance video shows people leaping out of the way of the car, which drove with its headlights off, and one victim holding onto the hood of the vehicle before being flung in the air. When police arrived at Halsey Street, the 23-year-old driver had fled the scene on just three tires, but they have since been taken into custody. They were found nearby at Saratoga Avenue. The driver has since been identified as Naquan Ricks of Brooklyn. He is facing multiple charges, including seven counts of reckless endangerment, leaving the scene of an accident, vehicle assault and DWI.